For long time Evernote users, the thought of leaving the service is daunting if for no other reason that the fear of losing notes and notebooks or, even worse, having to copy and paste all those notes into a new app. That is the scenario that faced me at the beginning of this year. As a long time Evernote user, my company standardized on Office 365, of which OneNote is a part of the suite. In my case, I simply started using OneNote January 1st while I kept my notes in Evernote simply so I could avoid this problem. Microsoft it seems has heard this dilemma from a lot of people and on Friday announced a new Evernote import tool for OneNote. made a backup (it will have a .ENEX) you can import that way as well but it will take a bit longer. I tried out this new OneNote import tool over the weekend (you can download it here) and I fully admit I approached it with trepidation. I had been an Evernote user since 2011 and was still getting my arms around Microsoft’s note app and the last thing I wanted was a hot mess of notes and notebooks everywhere. I have to say that the importer worked extremely well and exactly as advertised. 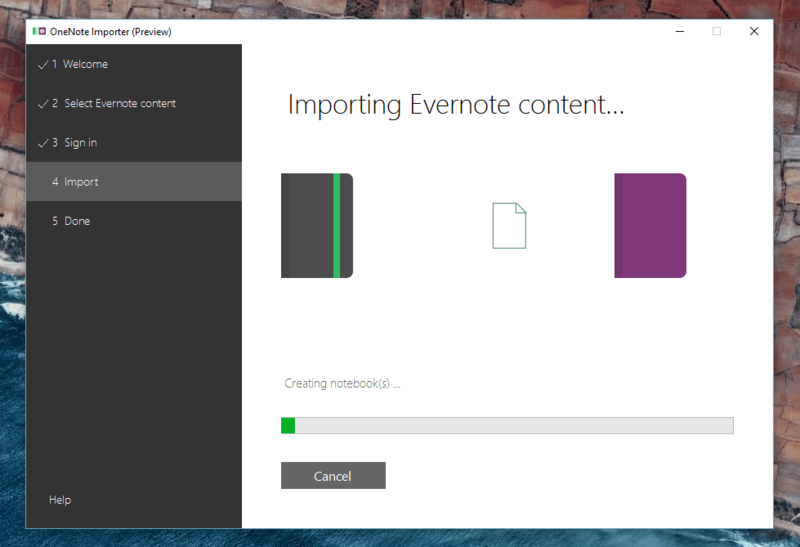 Once I completed it, I opened up OneNote and all of my new notebooks from Evernote were exactly as I expected. I think simply did some clean up for personal organization and off I went. In all, I imported 120 notebooks (yeah, I used Evernote a lot) and over 1500 notes (uh, yeah, did I tell you I write everything down in meetings?) and the import took less than 5 minutes. Microsoft does point out that this tool is still in preview (translation: Beta) so things may not work 100%. Obviously for me it worked flawlessly and imported notes including their attachments but your mileage will vary. If you are making the move from Evernote to OneNote, the bottom line is that this tool will make things a whole lot easier.